Tarbit has continuously built new ships since 1999. The first two were Bithav delivered in 2000, and her sister ship Bitflower, delivered in 2003. Both were built in Holland. Building these special tankers demanded the company's collective know-how since bitumen transport makes special demands in terms of design and operation. The product and chemical tanker Bit Oktania delivered in 2004 is the company's first ship built outside Europe. Collaboration with Shanghai Edward Shipyard in China has continued and a further two product and chemicals tankers of 25,000 dwt have been delivered in 2006 and 2007. These ships are built for environmently-friendly transports with a very high safety profile including double engine rooms, propellers, rudders and integrated bridge adapted to future tanker transports. 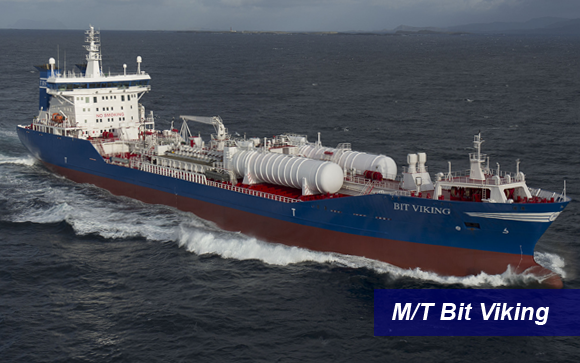 Tarbit’s ambition with “innovative tankers” latest showed in the project to convert Bit Viking into the world’s first LNG fueled product tanker. The vessel is in operation since 23rd of October 2011.